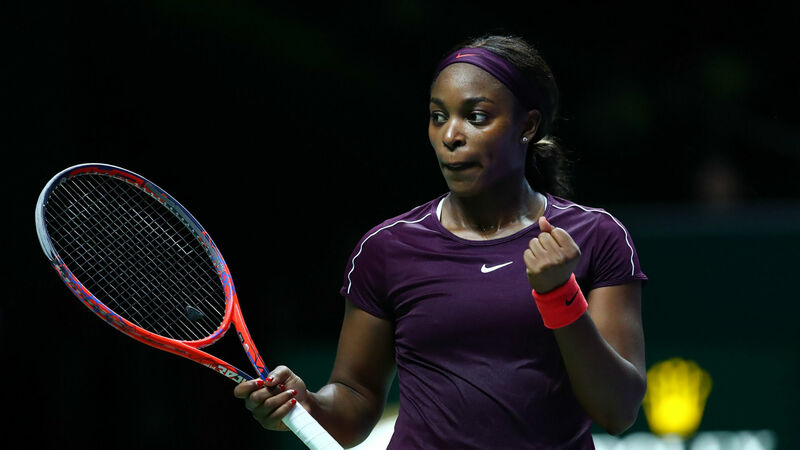 Sloane Stephens produced a brilliant comeback Saturday to advance to the final of the WTA Finals with a three-set victory over Karolina Pliskova. The 2017 U.S. Open champion went into the encounter in superb form, having won all of her group matches en route to the last four in Singapore. But she stumbled early, losing the first set 6-0 and going down 2-0 in the second set. Stephens recovered, winning six of the next eight games to push the match to a third set, which she dominated to prevail 0-6, 6-4, 6-1. Stephens will play Elina Svitolina for the championship. Pliskova needed just 31 minutes to wrap up the first set, her powerful and accurate groundstrokes allowing her to consistently dictate the rallies as Stephens, hindered by a lack of footwork that has often been a problem, struggled to make any impact beyond stringing together errors. The second set looked poised to follow a similar pattern as Pliskova made it eight games in a row, but Stephens finally stemmed the tide and broke when a rare errant forehand came off the racquet of the former world No. 1. Stephens gifted Pliskova an immediate break back by sending a lazy backhand long, but a double fault returned the initiative to Stephens and she held firm to force a decisive set. Pliskova committed 21 unforced errors in the second, and she was no more composed in the third as both players proved unable to hold serve until Stephens did in the fourth game with an ace to take a 3-1 lead. Yet Stubbs’ words failed to have the desired impact and a double fault handed Stephens a commanding 4-1 lead. Her confidence and full range of movement completely rediscovered, Stephens, ranked No. 6 in the world, raced to the final two games as Pliskova, resigned to her fate like Stephens in the first, ballooned a forehand wide.